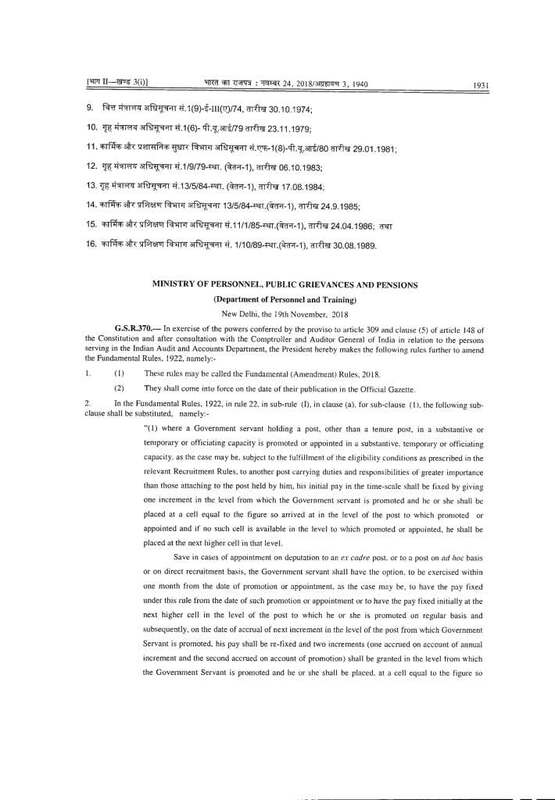 Save in cases of appointment on deputation to an ex cadre post, or to a post on ad hoc basis or on direct recruitment basis, the Government servant shall have the option, to be exercised within one month from the date of promotion or appointment, as the case may be, to have the pay fixed under this rule from the date of such promotion or appointment or to have the pay fixed initially at the next higher cell in the level of the post to which he or she is promoted on regular basis and subsequently, on the date of accrual of next increment in the level of the post from which Government Servant is promoted, his pay shall be re-fixed and two increments (one accrued on account of annual Increment and the second accrued on account of promotion) shall be granted in the level from which the Government Servant is promoted and he or she shall be placed. 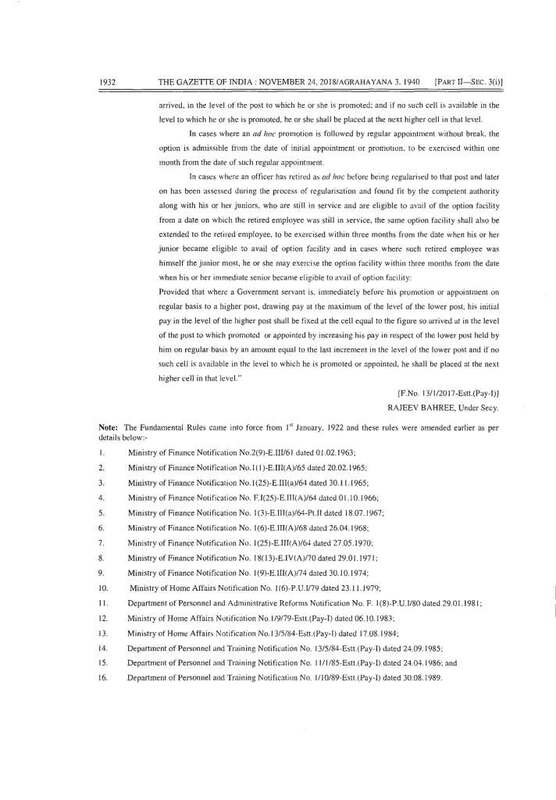 at a cell equal to the figure so arrived, in the level of the post to which he or she is promoted; and if no such cell is available in the level to which he or she is promoted, he or she shall be placed at the next higher cell in that level. 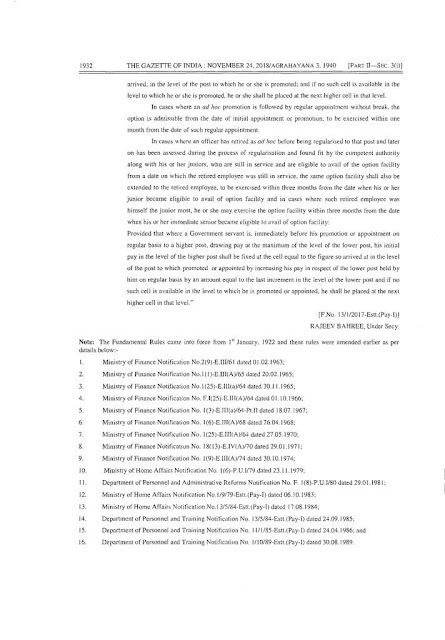 In cases where an ad hoc promotion is followed by regular appointment without break, the option is admissible from the date of initial appointment or promotion, to he exercised within one month from the date of such regular appointment. 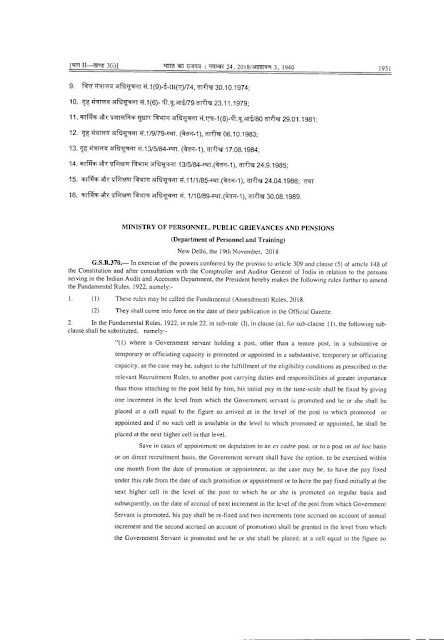 Provided that where a Government servant is, immediately before his promotion or appointment on regular basis to a higher post, drawing pay at the maximum of the level of the lower post, his initial pay in the level of the higher post shall be fixed at the cell equal to the figure so arrived at in the level of the post to which promoted or appointed by increasing his pay in respect of the lower post held by him on regular basis by an amount equal to the last increment in the level of the lower post and if no such cell is available in the level to which he is promoted or appointed, he shall be placed at the next higher cell in that level."